Are you ready for it? Join us for first-ever flash sale! Select suits in solid black, navy and medium grey in our super 110s (A Collection fabrics) are on sale for $500.00 starting today. Appointments must be booked before February 28, 2019. Contact us at 617-286-6135 or customerservice@9Tailors.com to book your appointment. 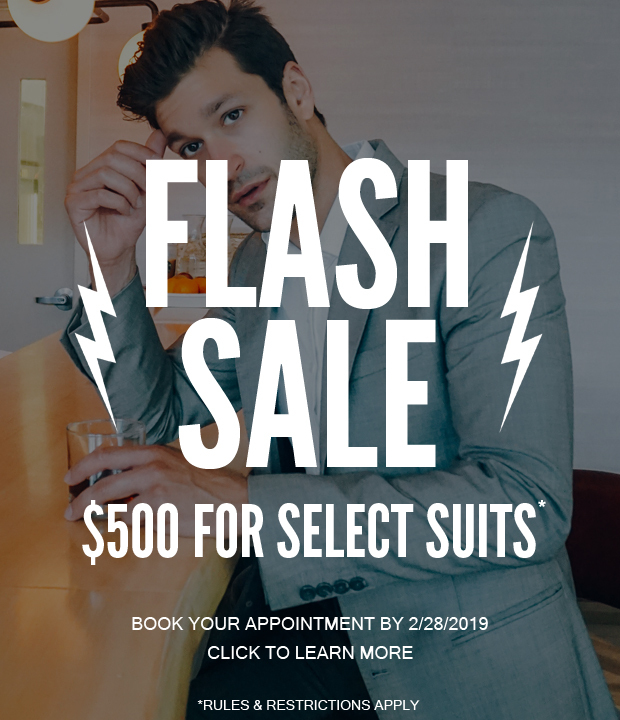 Appointments and/or payment of suits must occur between February 15 through February 28, 2019. Applies to select black (MK14784A), navy (MK14792A) and grey (MK14788A) suits in our A Collection. Taxes and other a la carte design fees (e.g., contrast lining, monogram, special buttons) may apply. Sale cannot be applied to past orders and cannot be combined with other offers.